Through Project Home, faith communities provide emergency shelter space for Ramsey County families facing homelessness. Church social halls, synagogue classrooms, and school cafeterias become home for a short period of time for families experiencing homelessness through Project Home. Before entering emergency shelter, these families struggle with choosing to pay the rent or put food on the table. Each month, two area faith communities host 20 emergency shelter beds each. Other faith communities join with them, providing volunteers to support the shelter sites. In 2018, 10,312 shelter beds were utilized, with the support of dozens of faith communities. 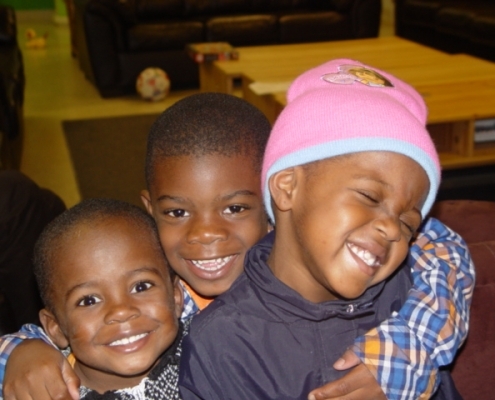 Donate items: Help us meet our families’ basic needs as they begin to put their lives in order. Most needed items are feminine hygiene products, towels and washcloths, disposable razors, deodorant, games, craft supplies, and coloring and activity books. Donations can be dropped off at our office any time during office hours. Serve as an evening shelter host: Volunteer from 5:30–8:30 pm, greeting guests, serving healthy snacks, conversing with guests, and playing and reading with teens and children. View the full position description. Serve as an overnight shelter host: Volunteer from 8 pm–7:30 am weekdays and until 9:30 am on weekends. Responsibilities include playing and reading with teens and children, talking with guests, securing facility before bedtime, waking up guests, serving a light breakfast. View the position description. Volunteer on move day: Help transfer shelter supplies from one hosting faith community to another at the beginning of each month. If you are seeking emergency shelter, please dial 2-1-1- (or 651-291-0211).